For years, I have heard sugar makes children go wild from parents, teachers and even kids. This "broken record," was known by I feel everyone and many in fact believed it. I know, I did. I guess for many children this was the time when we were able to run around screaming, and when we would get in trouble...just blame the candy. But to my knowledge from our lectures and also some research, it was amazing to find that this is actually not true, and there is no effect on sugar and being hyper. 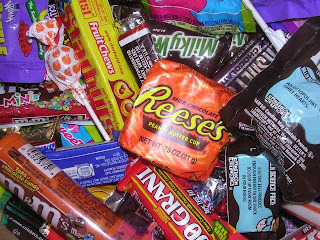 A source named Nonas from ABC News states, "There is no such thing as a sugar high. And there is no such thing as sugar making you nuts. There just isn't." When this source asked some children what happens when they consume sugar answers like it makes me crazy, I go nuts... were some to name a few. Drs. Rachel Vreeman and Aaron Carroll of Indiana University School of Medicine performed an experiment to prove that sugar had no impact of children. They stated, "At least 12 double blind randomised controlled trials have examined how children react to diets containing different levels of sugar. None of these studies, not even studies looking specifically at children with attention-deficit/hyperactivity disorder, could detect any differences in behaviour between the children who had sugar and those who did not." This I find interesting. It is just funny that for so many years, people were so serious about sugar and children being hyper. But there is no proof that it actually exists. I wonder how those parents who denied to give anything sugary to their children still feel on the subject? Does sugar affect children's hyperactivity was submitted to Coca Cola, to be answered, definitely not. I guess alot of the candy companies are happy to find that these studies show no affect on childrens' hyperactivity and I guess I was one of many that were able to blame the crazy energy on the sugar we consumed. I have always believed this myth too, not just because growing up I was told it frequently, but to me kids usually seemed as if they became more hyper after gorging on candy. Being a waitress I always used to cringe when parents would order a shirley temple or soda for their crazed child, thinking that it would make their behavior worse...guess I was wrong. This post makes sense, and maybe the real issue is finding out why children with ADHD love candy so much. Maybe its not the sugar that makes them nuts, but the already hyper kids that over indulge in sugar. I personally get tired when I eat candy so this post made me laugh. I was a true believer in this myth. I guess sugar doesnt make me hyper so why would it make children hyper? However to much sugar consumption is still not healthy for children so parents who give their children to much sugar may not cause their children to be hyper but causes them harm in the long run.